To enjoy Corbett weekend tour wake up in the morning and leave Delhi as early as you can. Distance between delhi to corbett approx 270 kms and it’s a maximum 7 hours journey, if you have own transport. Have breakfast on the way at gajraula, by lunch reach ramnagar and check in to resort. In evening, it’s a time to take your swimming costume and jump in to swimming pool. Crystal clean cold water refreshes you for evening nature walk. Back to resort, enjoy evening with lite music. Have dinner and overnight stay at resort. Early morning hotel staff give you wake up call. You will be getting ready for morning jungle jeep safari. A jeep will pick you from resorts, from entry gate of jungle a expert guide join you and in this 3 hours safari he give you all information, knowledge about the wildlife and corbett national park. Back to resort, have breakfast and again take your bath in swimming pool. Kosi river is another option where you take bath. If you are taking bath in river a guide must be there. Have lunch and enjoy the indoor/outdoors games. After lunch go to dhangarhi museum or corbett fall, back to resort, it’s a tea time with snacks. Dinner and overnight stay at resort. It is free morning for you, make your own tour and enjoy the day 3 morning. Morning nature walk can be an option. After breakfast bye-bye to resort and heading to onward destination. Locate in Connaught Place - Delhi ! 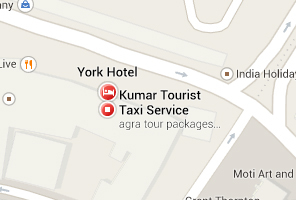 Kumar Online Taxi Service Delhi : Kumar India Tours.